I have always been using Windows MediaCenter as a replacement for the Windows Shell on my Acer, even after the upgrade of this HTPC to Windows 8 x86. But I have always been also a big fan of the MediaBrowser plugin for MediaCenter. I was unfortunately stuck to MediaBrowser 2 as the latest version was relying on a server component which couldn't be run without the windows shell. Good news, MediaBrowser 3's server part can now be run as a Service as solve my issue! As a reminder (see here), I am user a "public" Windows Account (i.e. : with a blank password) to grant my kids access to Windows MediaCenter. Windows MediaCenter is replacing the Windows Shell to improve the user experience; it's indeed much easier for the kids to start a cartoon if they don't have to go through Windows Explorer to start MediaBrowser (embedded into Windows Media Center). One user profile without password to grant guests and kids access to public content. Another user profile with a password to protect accessed to private/adult content. Check that you didn't tick the option "Run server at Startup" in the "Advanced" tab as this is not compatible with MediaBrowser running as a Service. Set the Windows account of a local administrator - with adequate rights to access your media (e.g. : on your NAS) - as a "log on" account on the Media Browser Service. Back to MediaBrowser's configuration UI, rescan the media libraries via the "Scheduled Tasks" tab. Possibly wait until the "rescan" task is completed and run Media Browser to check that you can access your media. Log-on with your "public" Windows Account and check that you can access your media. (*) The user profiles defined in MediaBrowser are not related to any specific Windows account. E.g. : the username and password set for those users is not used to access network resources, etc... There are only used to define various "profiles" within MediaBrowser. It's also (among other) a replacement for the "pin code" that used to protect access to libraries depending on the "rating". Although the volume of Windows was still 100%, I recently had to push the volume of my surround system from 8 (as used usually) to 28 to ear the sound of movies and cartoons played on my HTPC. The problem was Windows 8 did (mysteriously) lost the configuration of the speakers. They used to be configured as 5.1 and appeared to be now configured in stereo. I recently tried to upgrade Media Browser from version 2 to version 3 on my HTPC. It was not a success because Media Browser 3 comes with a client part and a server part. If the server part is not running (locally on on the LAN), the client part can't run either. And the server part might not run on my HTPC because it may only start if the windows shell starts (it's not a Windows Service but a Startup Program instead) - shell that is not running on my HTPC as it has been replaced with Windows Media Center. After this trial, I did re-install Media Browser 2. Although I would be quite surprised if that would be true, this is maybe why the configuration of the speakers went back to "stereo" instead 5.1 ?! To check what was wrong, I had to close Windows Media Center using F4 (as not only it replaces the Windows shell, but it is also run without any "close" feature thanks to the option /mediamode). I did call the Task Manager (CTRL-Shift-Del) and run a new Task: Explorer, to get a Windows Shell. I was next able to check the Sound System Properties. Right-Click the "Speakers" icon in the systray. The Speakers where configured in stereo. I did reconfigured them as 5.1. Next, in the "Enhancement" tab of the "Speakers Properties" window, I did re-enable the "Loudness Equalization" and "Speaker Fill". I did next log-off and restart a session. The issue was solved. As the upgrade of my Acer iDea 510 with Windows 8 x64 and the MCE feature pack failed (See here) as well as using XBMCbuntun (See here), mainly due to issue with drivers, I have decided to give a try to Windows 8 x86. And now, the result is really great - the HD video is playing very well and standby mode is back! The only tricky part was to force the installation of Nvidia Video Drivers for Vista on Windows 8. First, I did install Windows 8 pro x86. Notice that during the installation, I did check the option to automatically activate Windows. On this page, request a free licence for this pack (Offer limited until 31 jan 2013). On the Start Screen, type "add features" to select "Add Features to Windows 8". In the "Add Features to Windows 8" window, select "I already have a product key" and enter the free key got previously for the MCE pack. After that, I didn't experience the same issue (licence not valid for activation) as I did when testing Windows 8 x64. I means that I most probably skipped a step during the first time ? Possibly I did install the MCE pack before the activation of Windows ?! At that time, I noticed that MCE was reacting very slowly and not displaying smoothly movies... Just like during my tests with Windows 8 x64... To solve this, I really had to install video drivers specific for Acer iDea 510's graphic card: a NVidia GeForce Go 7600. Drivers for the GeForce Go 7600 compatible with Vista or Windows 7 should theoretically run fine on Windows 8. But unfortunately, the setup usually refuses to install those drivers because they don't officially target this OS. It's only due to information configured in the .inf file used by windows to install the drivers. It means that we can reconfigure those settings to become "compatible" with Windows 8. Those are unofficial drivers and not WHQL certified. Audio via HDMI is not supported by these version of the drivers. You need an older version (See replies bellow this post). Once the drivers and the .inf file downloaded, extract the self-extracting package (exe file) and move nv_disp.inf into the extracted folder ("180.70_vista"). Run the setup.exe and don't be afraid if you see that it's for Vista. Once installed, reboot the system. You will clearly see the difference (the resolution will be much higher - 1920x1080 instead of 1024x768 - and MCE runs now much faster). Click Haali Media Splitter > Options tab > Languages > Audio Language Priority > enter "fre" (the three letters of French). Click Ok.
Click LAV Splitter > enter "fre" in both "Audio" and "Subtitle" and select "Only forced Subtitle". Click Ok.
Click LAV Video Decoder. In Hardware Acceleration, select XDVA2 and check the two options H.264 and MPEG-2. On the Start Screen type "system", click on "Settings" and select "System" in the results. 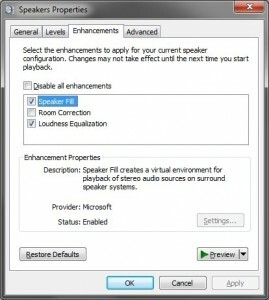 Enable "Allow remote connections to this computer"
Right click the speaker in the sys-tray and select "Playback Device"
At the bottom of the tab "Payback", click on "Configure"
Select the second 5.1 in the list of "Audio Channels" (with 2 speakers on the back). In the list of results, click on "Create Standard User Account"
Select "Add a new user in PC settings"
Under "Other Users", click on "Add a User"
At the bottom of the page, click on "Sign in without a Microsoft Account"
At the bottom of the page, click on "Local Account"
Enter the name "Media Center", nothing else (no password) and click Next. Change the picture of the user "MediaCenter"
Click on your account in the top-right corner and select "MediaCenter"
Wait while Windows prepare the PC for this user. Once on MediaCenter's Start Screen, open IE and find a nice picture, right click on it and save it in the picture library. Go back to the Start Screen and click on MediaCenter's account in the top-right corner to select "Change Account Picture"
E.g. : Add the "Pictures" folder of the NAS. This one must be either public or the user "MediaCenter" must be granted access via the NAS user management UI. in the new window, open the "User" tab and select "MediaCenter". Then click Ok, Finish and Ok. In the right pane, double-click on "Custom User Interface"
In the new window, check "enable"
Switch to the user MediaCenter for testing purpose! Multiple switches can be enabled by entering multiple switches separated with a space in the target input. The front Digital Display is recognized by Windows 8 but not displaying anything else that "Welcome To Aspire IDEA. I did install the drivers from Acer web site (named "MPC718_install_V6_13_32_1026_Oscar.msi") and those devices were recognized without any issue. Standby mode works out of the box (nothing to fine tune in Windows) with the remote control. I didn't change the BIOS settings since my first try with Windows 8 x64. Wake-up on Lan works out of the box (nothing to fine tune in Windows) if the shutdown was initiated from MCE (or XBMC - see here after). If the shutdown is done from the Start Screen, WOL does not work!!! The difference in support for WOL or not depending on where the shutdown is initiated is explained here: In Windows 8, the default shutdown behavior puts the system into hybrid shutdown (S4) and all devices are put into D3. Remote Wake-On-LAN from hybrid shutdown (S4) or classic shutdown (S5) is unsupported. Indeed, a boot after a default shutdown is fast. On the opposite, a boot after MCE/XBMC's shutdown is clearly much slower. On the Start Scren type "Power" and select "Settings". Click on "Change what the power buttons do” in the list of results. Uncheck “Turn on fast startup (recommended)"
Select "Save Settings" and test a shutdown/WOL. It works ! The "Restart" feature doesn't work. The PC shutdowns but does neither power off nor reboot... This seems to be due to the video drivers as the PC restarts fine with other drivers (but with those, the PC didn't stay in standby mode. It was waking up immediately). XBMC 12 runs quite fine on Windows 8 pro too. WOL works fine after either an Hibernate or a Power Off (Even without disabling "Fast Startup" in the "Power Options"). The purpose: try if XBMC is compatible with the hardware of a PC before doing a full installation. Tested on my Acer iDea 510 with success. Works quite well and could replace Windows 8 Pro with the Media Center Pack ! Download Linux Live USB Creator, a.k.a. Lili, to create a bootable USB Key with a linux (Could also try Unetbootin USB Creator ?...). Download an ISO of XBMCbuntu from here. To boot another linux, for any purpose, download an ISO for i386 compatible with Lili (When using UNetbootin downloads itself the selected Linux image). Create the bootable USB Key following the how-to. Choose a USB flash drive in the dropdown list. Select the ISO of XBMCbuntu downloaded previously. Choose the size of persistent data (usually between 250 MB and 2 GB). Click the lightning button to start the creation. First try failed. It stops with "load fallback graphics devices [Fail]"
Search and Replace "quiet splash" with "quiet splash vmalloc=256M"
The remote control works fine so far. Including Shutdown (power-off). Configuring the System to use Suspend instead of Shutdown works fine only once. Suspend is really immediate (less than 1 sec). However, I didn't find yet how to configure the remote to wake-up the HTPC. During the use of XBMC, I was able to play HD movies from a SMB Shared Folder of my Synology. Sound plays in 2.0 (stereo), also for movies in 5.1 (with downmix), but default volume is really low compared to the default volume in Windows 8. Within XBMC, I have to boost the Volume Amplification. So it's not the best possible sound. Sound doesn't play correctly at all in 5.1 (although I have a 5.1 system and the movie is in DTS 5.1) ?! During the shutdown, I noticed an error "Killing all remaining process [Fail]". When shutdown is initiated from the remote control, XMBCbuntu asks to press enter to power-off after the error message here above. After that, the first issue arrived: Windows 8 started to pretend its licence was not valid for an activation. I did try to retype my key without success (That was yesterday). However, today, after a reboot, it appeared that Windows 8 was again activated ?! At that time, I noticed that MCE was reacting very slowly and not displaying smoothly movies... Maybe because the Media Browser service was indexing my content? Install Win8Codecs for x64. (Usually, I don't use a pack but will give a try to this one today). The front Digital Display is recognized by Windows 8 but not displaying anything else that "Welcome To Aspire IDEA). Drivers are missing for 3 devices (PCI devices database available here - how to here - and Microsoft catalog to search drivers is available here). 2 Multimedia Video Controllers with Device Instance Path "PCI VEN_14F1 DEV_5B7A SUBSYS_5B7914F1 REV_00\4 197A8245 0 08F0" and "PCI VEN_14F1 DEV_5B7A SUBSYS_071812AB REV_00\4 197A8245 0 00F0". Those are the "TV Tuner Yuan MPC718 Hybrid HW encoder with FM"
Another one not identified but related to ACPI with a device path "ACPI\AWY0001\2 DABA3FF 1" and a hardware ID "ACPI\AWY0001", I found it was used for the "Away Mode System" and required "Intel QRT Driver" (Quick Resume Technology). the Intel QRT Driver 1.6 for Vista to be found on Acer Support site works fine. Once unzip in a folder of the PC, go to the Start Screen, type "Device Manager" and start this manager. Select the "Unknow Device" and update the driver selecting the folder above. Note for later purpose: Intel Driver Update Wizard available here. The graphic card chipset Nvidia GeForce Go 7600 is recognize but the drivers installed are from Microsoft (Basic Display Adapter) and not specific ones... ?! The auto-detection wizard from NVIdia is here. It doesn't find anything specific more appropriate than the MS Basic Display Driver... I did select myself GeForce, GeForce Go Serie 7 (notebook), GeForce 7600, Windows 8 64 bits; no result. Select "Disable Driver Signature Enforcement"
Sleep state was not enabled. The command "Powercfg /a" also reported that "Hybrid Sleep" was not enabled because S3 was not available (to be checked in the BIOS). On the Start Screen, type "Power Plan", click on "Settings" and select "Edit Power Plan" in the results. Click "Change Advanced Power Settings"
Click "Change settings that are currently unavailable"
I don't use WiFi, so I set "Power Saving Mode" = "Low Power Saving" under "Wireless Adapter Settings"
I should find how to configure the PC to see "Sleep after" and even possible "Allow Hybrid Sleep". I will here after try to investigate this issue in details. S1, S2, S3 are not supported although S1&S3 are now enabled in the Bios. The drivers \FileSysem\srvnet is preventing the system to enter sleep. On the Start Screen, type "Advanced Sharing", Click "Settings" and Select the "Manage Advanced Sharing Settings"
Click on "Choose media streaming options" under "All Networks\Media Sharing"
This is NOT doing the trick: edit the current Power Plan to "Allow the computer to sleep" under the node "Multimedia settings" > "When sharing media". Its finally clearly stated that the PC may not enter the sleep mode due to the Microsoft Basic Display Driver which has disabled S1 and S2 sleep states. To see if there is still anything preventing the PC to enter the sleep mode, type the command "Powercfg /requests". You should see "None" for every category. If after a reboot, your still have the same issue with \FileSystem\srvnet, try to override it with the command "Powercfg -requestsoverride driver \filesystem\srvnet system"
To undo this command, type "Powercfg -requestsoverride driver \filesystem\srvnet"
Selective Suspend State: this one can be enable or disable on the USB node while editing the Power Plan (in the Power Options). A USB device driver can send a message to windows telling it to idle the device. This puts the device in a low-power state (the suspend state). When a USB device is suspended, windows does not wait for it to respond before entering a sleep or hibernate mode. If you disable this feature, the system will simply return a failure to the driver when the driver attempts to enter suspend state. If the driver complies with Microsoft guidelines, it will simply retry the idle request at every expiration of its idle timer. S1: All processor caches are flushed, and the CPU(s) stops executing instructions. Power to the CPU(s) and RAM is maintained; devices that do not indicate they must remain on may be powered down. S2: CPU powered off. Dirty cache is flushed to RAM. S4: Hibernation or Suspend to Disk. All content of main memory is saved to non-volatile memory such as a hard drive, and is powered down.